What ever stomach bug Little Bear had last week, it found me. I tried the game of hide-and-seek but I’m afraid the bugger caught me and got me good too. I’m feeling pretty played out. Our food stock has been built up and the limited space my parents have given for us has filled up and without realizing it, the Food Stamps piled up a bit. So I did what any good Mormon would do: sat down with my dad and went over the newspapers to check the grocery sales in the nearby towns and went bulk shopping to build up my food storage. Even brought a few coupons with me. My focus this time around was on freezer goods and namely meats. If stored properly, most meats at minimum will keep for three months. So with Scholar Owl in tow, I purchased a crap ton of hot dogs, chicken, and pork. I did snag a bit of corned beef and a few beef tips, but not much. Even on sale, beef is still expensive. The excursion wiped out what I had in stamps for the month, but we won’t go hungry and that’s the point. I still have child support for buying dairy since I don’t have the fridge space to buy large quantities of that. Well, even if I did, shelf life and how fast the boys can eat it limits how much of it I can buy in a single shot any way. Since you’re permitted to buy seeds with Food Stamps to grow your own veggies, I’m hoping that Dad will let us have a small plot, but that means we need to get started on that right now. My boys aren’t to most avid gardeners and I’ll admit, anything that comes before the harvest I’m kind of clueless. The harvesting and processing part I’ve got down. Chances are, we’ll just end up working in Dad’s plot and not buy our own seeds. He’s already said whatever comes out of his garden is fair game if we help out. I think that’s fair. It’s just a lot of work and Dad tends to let that garden get out of hand. At least this year he only plans to have three rows of potatoes – half of what he had last year. I seem to recall he had eight at one point. We just couldn’t keep up with it all. I seriously hope he doesn’t go rando on us and plant beyond what we cope with. As it is, he hasn’t even tilled the fields yet so we’re already behind this season. Again. Practice for the Special Olympics team is under way and Scholar Owl is volunteering as an aide for the coaches. So he helps set up the Bocce equipment, guide stretching exercises, and paces with the speed walkers. Stuff like that. He seems happy about it and they all seem to like him. Tuxedo Cat still goes to piano lessons and is still composing music. I didn’t stay for the lesson this week – because stomach bug. When I came back to pick him up, I found them talking about recording his music some time in the near future. I think that would be neat for family and close friends – and whomever else he wants – to be able to hear him play even if they don’t live nearby. I might not be able to fully understand the story behind the music he’s composing, but I’m happy to see the glow he has while he’s doing it. It makes me wonder if this was how Mozart, Bach, and Beethoven were like when they were composing so long ago. Well, before Beethoven started losing his hearing I mean. Actually, it makes me wonder about any of the artists through out the ages. Even the artists of today. Do they all glow like that when they create? Does the very act of creating something make any person shine from the inside the way my son does with composing and playing music? Is it a universal thing? Or is this something I’m only noticing because he’s my son? I want to believe it’s universal. That it’s a magic for every soul willing to find their passion. I wonder if this glow is something you can feel and what it looks like for writers. We’re an isolated lot for the most part. We don’t typically roam in packs with typewriters, clicking on our keys, when we’re actively working on a project. People think we’re pretty weird as it is. I’d imagine we’d be treated like the plague if we behaved like a herd of some kind. This is what I sleep to every night from spring to fall. Nature’s lullaby. Or sometimes it’s the melody to the rhythmic tick of gears in my head as I’ve continued to plug away at this Leviathan Worldbuilding Method Template. Okay, first let me just say this lady wasn’t kidding when she named it that! I’m only on step #17 now and it’s been TWO WEEKS OF SOLID WORK. No joke. But to be fair, I started with nearly nothing but bare bones of a world so I can only imagine how much work there is if you are starting from zero. Step #17 asks me to make myself familiar all the relevant details regarding the skills needed in all the scenes. The outline I have from step #5 is just broad, rough ideas in a 3 Act Structure, loosely following the Lester Dent format. Like seriously it’s all duct tape, string, and bubble gum over there in step #5. It states very clearly in step #17 that if the outline I have so far is only a rough sketch, then it needs to become a more detailed one…. Well, I decided that it was time I figured out just exactly what kind of story I wanted to tell so I did what I do best and opened up Scapple and started browsing the net for various plot format to blend. Seems that someone else does (or did) exactly what I do, but here they combined them as some sort of “master plot” system. And… they’re missing some. So naturally, I had to keep browsing and studying, and all the while a beast was born in my Scapple file. In putting this together, I started to see some over lap so I stopped at the mystery one after researching the Western genre. Turns out what defines that genre isn’t the plot structure so much as the setting and the character archetypes. I have no doubt I’m missing some, but I feel like that it will only create more overlap. The point is, Scapple is a mind mapping program. You create moveable notes and you can link them together however you want. You can rearrange them as much as you like. It’s compatible with the Scrivener program, so you can select the entire mess you made in Scapple and drop it all into Scrivener. From there it’s converted to files/folders/cards – all depending on how they’re linked or not. And you can just start writing. AND…. that’s not what I did. I did drop the mess in there. And… I started tinkering. I’m well aware that Scapple is good for me when I want to think and process, but it’s not very good for me when I want to move forward with the ideas that I have or when I want/need to be productive. In other words, I can’t outline with Scapple to save my life. So I needed a master outline template that I can use whenever I need for any type of story. One where I can mix and match to my heart’s content, weave multiple plots and subplots if I wished, and discard whatever I didn’t need. Scrivener’s built in folder and multi-window system serves this purpose well. And I made two copies of this template. One for the novel/novella. One for the chapter and short story. I even sifted through pixabay.com for vector images to serve as custom icons for everything. Threw in instructions and checklists at various stages too! It’s still a beast, but at least it’s more manageable for me. And getting this finished made me very happy. So happy, that I wanted to share it with all of you! But that’s not what I did. I realized that not everyone uses Scapple or Scrivener. Which meant that if I wanted to share it with everyone, I needed to convert it into multiple formats…. Okay, so can I just be the first to say how much I HATE Scrivener’s compiler? I really don’t like the way it formats ANYTHING when it converts your file. Which means I had to manually format it all myself. In Notepad++ as a text file to start with and then open it in Open Office to format it into something less ugly. THEN Open Office converted it into all the other formats – including some I never heard of before. All the formats are zipped into one neat little folder. 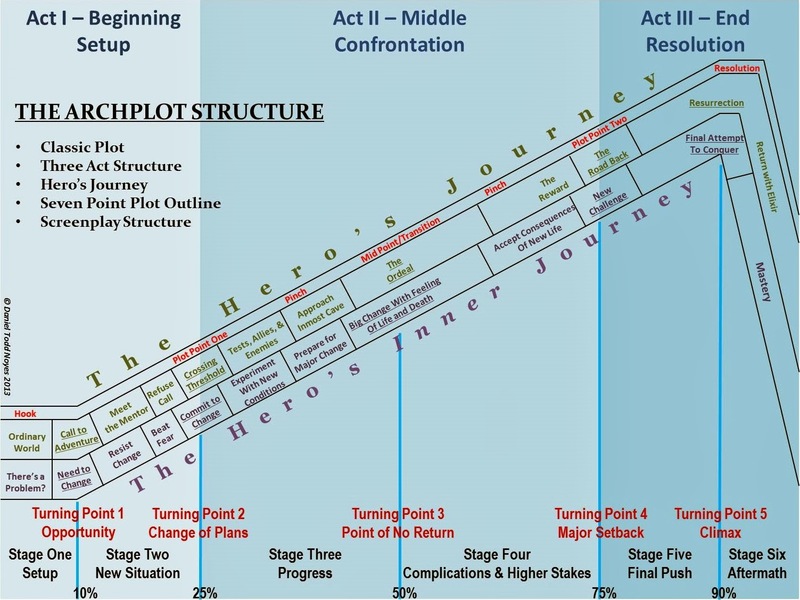 This entire master plot template – including the conversion process – took me two days to complete. So I hope you all enjoy using it as much as I enjoyed the process. Well, except the Scrivener compiling part. That part sucked. I don’t know what I did wrong there and I don’t have the patience to figure it out. So without further ado, here is the download link! Please let me know what you think! If something isn’t working, or if there is a plot structure that you think should be included in here, let me know. I like the idea of pairing the Virgin archetype character with a Hero archetype character for contrast.